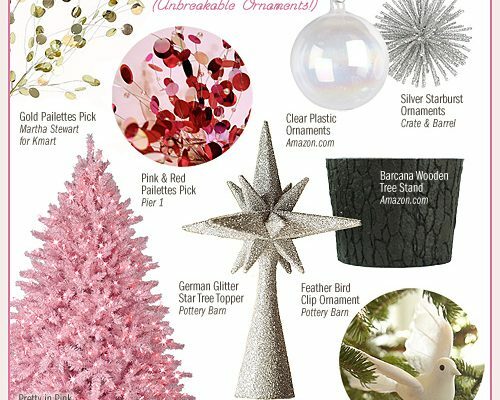 Here’s a cute DIY project to add a little sparkle and shine to your holiday! 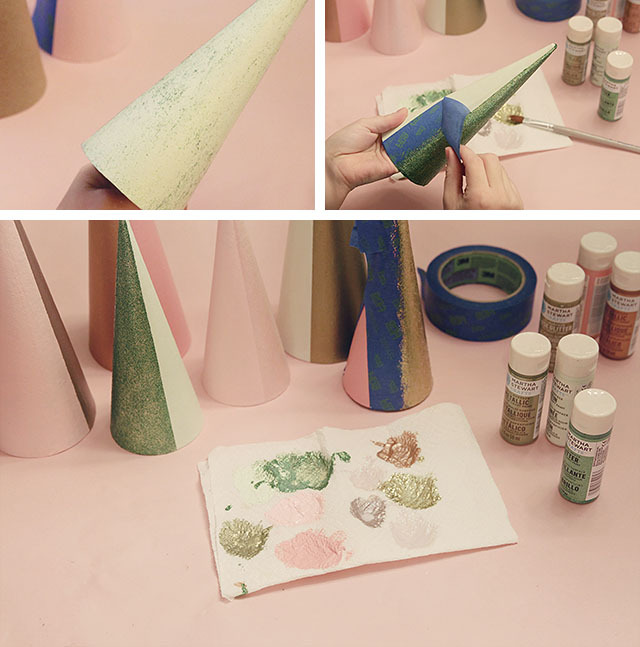 These colorblock Christmas trees took a few hours to create, but if you simplified the palette (and skipped the glitter paint), you could finish them in about an hour. Here’s what you’ll need. The smaller cones were to be glittered on one side, so I first painted the entire cone in a solid color. The larger cones were each going to be painted one one side with metallic paint (which I knew to have good coverage), so I started by taping them off and painting just half in a solid color. 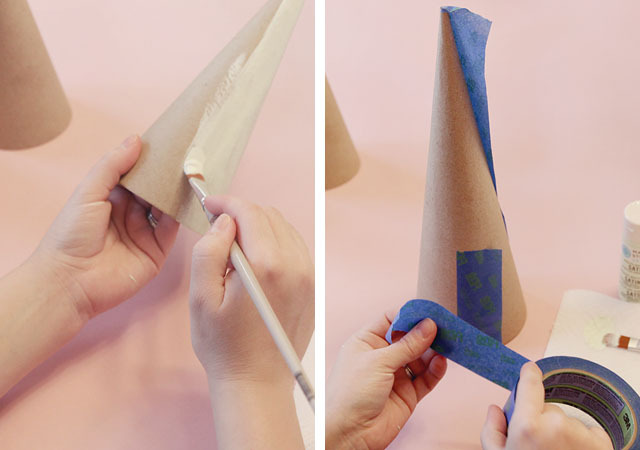 It’s easier to tape a cone vertically, though I’m sure these would look fantastic done horizontally if you’re up for the challenge. Acrylic paint dries quickly. I found that by the time I was done painting the last of my six cones, the first would be ready for another coat (I did three on each). After the last coat had dried, I removed the old tape from the larger cones and retaped them to paint the other sides. The metallic paints I used looked good after just one coat, but I still did three — because I am weird and like to keep things even. Adding the glitter… there went the whole ‘keeping things even’ idea. I lost count of how many coats of glitter paint I used! I knew they would take a while to build coverage, and I think I may have put 10-12 coats of paint on each cone. Early on in the process, I considered ditching the paint and just using glitter, but it was my hope that by using the glitter paint, each Christmas tree would be less likely to flake and leave a sparkly trail wherever she may go. So far, so good. The glitter is staying put, and I love the two-tone effect. I’m not sure if I’ve found the perfect place for these yet though. I like the effect of the mirror, doubling them and showing off both sides, but there’s already a lot going on in the hutch above, and with the stockings below. What do you think? Oh this is perfect!! I’m still decorating my place and these trees would look great!! Thank you! I have long loved those deer thanks to you and Emily Henderson. I just bought them on eBay, but the set looks to be tarnished. How do you recommend keeping them so shiny? I haven’t done anything but wipe them down with a damp cloth. Mine were (luckily) in pretty good shape already. What a cute idea! I’m totally making these this weekend! I love these! So simple and they make such a statement! Where are the stocking hangers from? I’ve been looking for simple, attractive stocking holders for FOREVER! They were from Hold Everything (remember their catalog? ), maybe 8 or 9 years ago. They were designed by Jonathan Adler. I love these! I don’t have any Christmas decorations, besides a Christmas “tree” I made from branches and my daughter’s popsicle stick ornament. I like how these are so simple and don’t cost much.. I may have to go get materials right now! I don’t think there’s such a thing as “too much going on” when it comes to Christmas decorations! I think they look fantastic and you’ve chosen a great spot for them. Even Christmas decorations could use a little editing down though! I think I may have found a better spot for them, in the living room. Love this!! They look store bought and less handmade! I have a question, where did you get your stocking hooks? They are adorable! They were from Hold Everything, but that company has been out of business for many years now. I just did the same but with foam cones. They didn’t turn out as I hoped. These Krfat ones look much better. I’ll pop out to the shop today :) Thanks for the tip. I wish they were still available! If we ever have any more children, I’ll have to find another somehow, or forgo my own stocking. ;) The hooks were designed by Jonathan Adler for Hold Everything, many years ago. 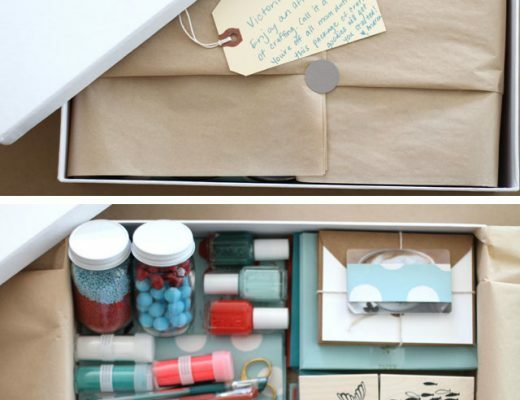 These are so pretty – love the simplicity! These look great! I love the glitter paint (and the lack of glitter everywhere that comes with it)! 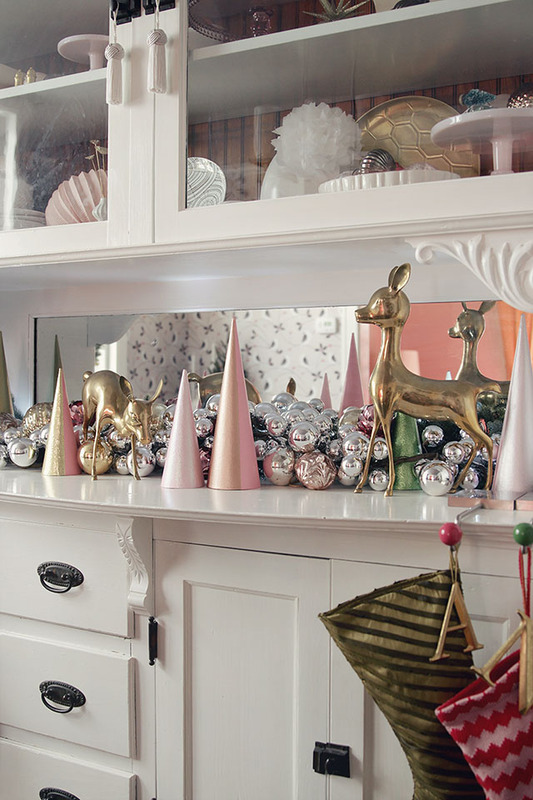 I also LOVE LOVE LOVE those stocking holders! They’re perfect for your house. I think I’m a glitter paint convert. No mess! So pretty, love these! I’m anti- loose glitter and pro- glitter paint, the extra coats are worth it! Love love this project. Also–have to tell you I got a sparkly pillow from Land of Nod after seeing yours here and I am in LOVE with it. It’s so beautiful. Oh, yay! I love that pillow. They look fantastic! I was considering making a few too, but I went with the cones instead. Maybe I’ll revisit the idea next year — I have scissors that cut fringe that are just waiting to find their purpose! No way! Fringe scissors? Must find me some of those- I do heart the cones tho!! Cute! 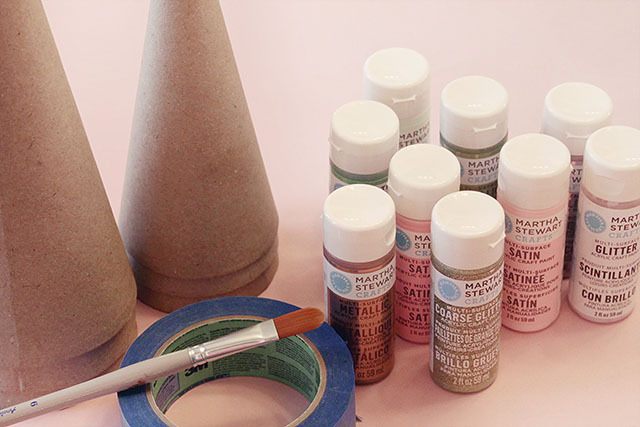 I just posted something about DIY Christmas trees but never even thought about color-block painting them. 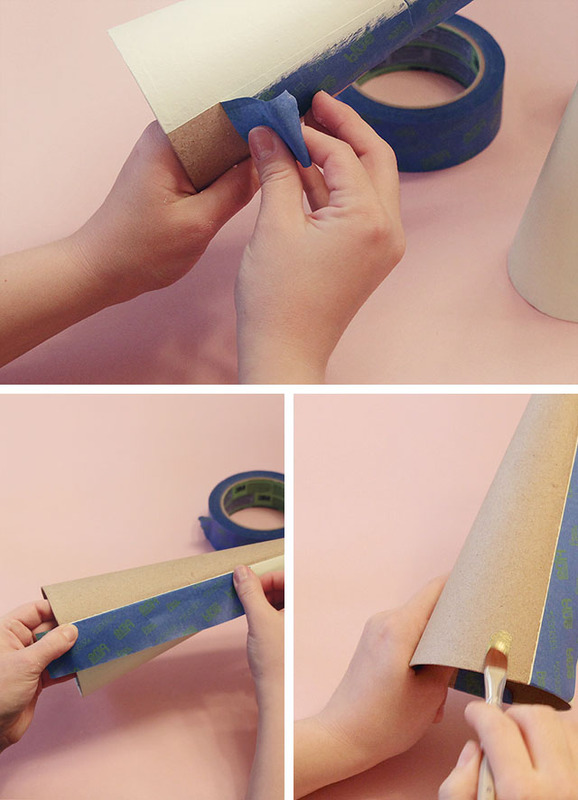 What an adorable DIY project for the holidays. I love the glitter, it adds a nice sparkle to the vignette. They look great! And I agree with you, they might be able to really shine in a different spot!! Your stockings are all so unique- where are they from? Absolutely adorable! 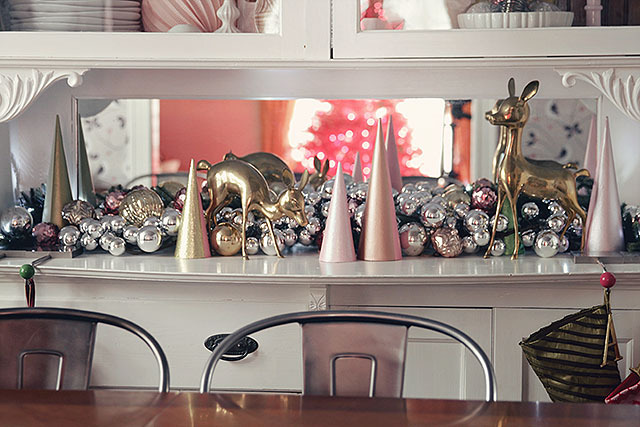 I love that they are surrounded by ball ornaments! This is a fantastic idea! The colors you picked are gorgeous! I really like the two tones, but the link for the paper I guess it is you used for the cones, isn’t a trusted link. Can you tell do they come that way, or do you make them up.